The GSD-803 is designed with modern metal compact housing and easy for deployment of high speed Gigabit networking in home or SOHO applications. Providing 16Gbps internal switching fabric, the GSD-803 can handle an extremely large amount of data in a secure topology linking to a backbone or high capacity servers. The GSD-803 provides 8K MAC address table, and wire-speed packet transfer performance without risk of packet loss. 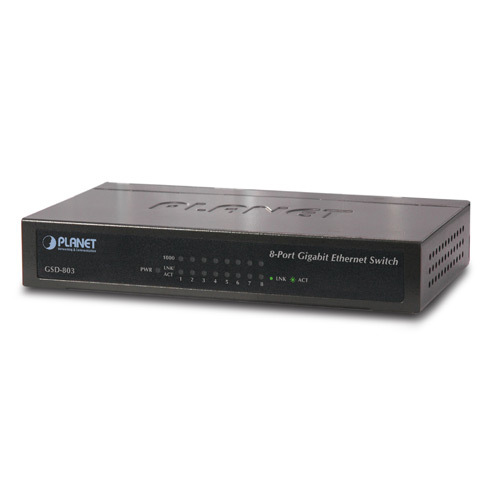 The high data throughput of the device makes it ideal for most Gigabit environments, especially for the network to be upgraded to a Gigabit environment. The GSD-803 can directly connect to department Switches or backbone servers. With up to 16 Gigabit per second of non-blocking switch fabric, the GSD-803 can be used to build a Gigabit high-bandwidth switched network quickly and easily. The GSD-803 Gigabit Ethernet Switch provides the best solution of high-speed Internet environment demanded by SOHO / Home and Power users. The GSD-803 accelerates the speed of data transmission between devices without worrying about the delay of high quality multimedia display. In aspect of home use, the GSD-803 integrates the speeds of 10, 100 and 1000Mbps which can fulfill your demands of transmitting high quality multimedia, games and other high-speed Internet applications. 2014-09-05 6.0 Release for hardware version 6.0. 2010-12-10 5.0 Initial Release for Hardware version 5.0.